Renting storage space without purchasing insurance is a risk that should not be taken. 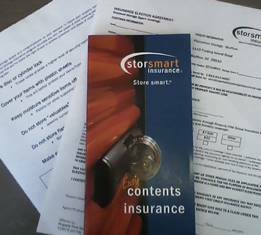 We recommend Storsmart Insurance - Storsmart is a self-storage contents insurance program with great coverage and affordable premiums. If you have specific insurance coverage questions call us at 318-396-5462, or feel free to contact StorSmart Insurance directly at 1-888-545-7627or via email at info@storsmartinsurance.com. The storsmart insurance program was formed by insurance and storage professionals with years of experience in the self-storage and insurance industries. As storage professionals they understand the ins and outs of both the day-to-day operations of self-storage and the importance of a quality self-storage tenant insurance program. 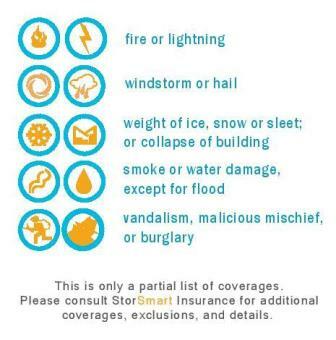 The storsmart insurance program was created to bring the best value and integrity for both owners and customers. 10. Insurance, THE OWNER DOES NOT PROVIDE ANY TYPE OF INSURANCE WHICH WOULD PROTECT THE OCCUPANT’S PERSONAL PROPERTY FROM LOSS BY FIRE, THEFT, OR ANY OTHER TYPE OF CASUALTY LOSS. IT IS THE OCCUPANT’S RESPONSIBILITY TO OBTAIN SUCH INSURANCE. The Occupant, at the Occupant’s expense, shall secure his own insurance to protect himself and his property against all perils of whatever nature for the cash value of the stores property. Insurance on the Occupant’s property is a material condition of this Agreement. Occupant shall make no claim whatsoever against the Owners insurance in the event of any loss. The Occupant agrees not to subrogate against the Owner in the event of loss or damage of any kind or from any cause.